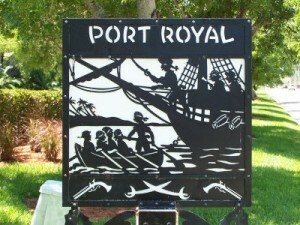 Entrance sign to Port Royal Naples FL. Port Royal is located at the southern most end of the Naples, Florida between the warm waters of the Gulf of Mexico and Naples Bay. Port Royal is an exclusive, luxury home community of 497 residential properties. It stretches from 21st Avenue South to Gordon Pass, bordered by the Gulf to the west and Naples Bay to the east. An inconspicuous black and white hand-made sign – complete with tall ships, swords and pirates making land (see picture to the right) – lets you know you have, indeed, arrived. Port Royal is home to some of the most expensive real estate in Naples, FL and the nation. The majority of the estate homes in Port Royal are either on the beach, right in front of the white sands Naples is famous for, or on deep, waterfront canals and bays. Wide, deep water (one of the only locations with this depth in the area) canals and no bridges to the Gulf of Mexico make this community a boater’s paradise. Yachts and sailboats over 80 feet can comfortably make berth in the waterways of Port Royal. Access to the Gulf is through Naples Bay or Admiralty Bay, then out Gordon Pass. Some of the widest bodies of water in Port Royal are Champney Bay, Man-O-War Cove, Galleon Cove and Treasure Cove. Surprisingly, Port Royal is not a gated community. The roads are public and attract many sightseers looking for a glimpse into the lives of the wealthy families who live there. Bike riders and walkers also use the streets of Port Royal to exercise amongst the roadside mansions. Regardless of it’s open access to the public, security is remains tight. Private security guards and cameras patrol the streets of Port Royal 24-hours a day. Most of the homes have state-of-the-art security systems. And at least one home has a door that can withstand the force of a rocket-propelled grenade (RPG) explosion! Many of the older homes that were luxurious in their day have been torn down to make way for larger and more opulent structures. Today, home prices can vary from over $80 million for newer beachfront estate homes to just under $3 million for smaller lake front homes.